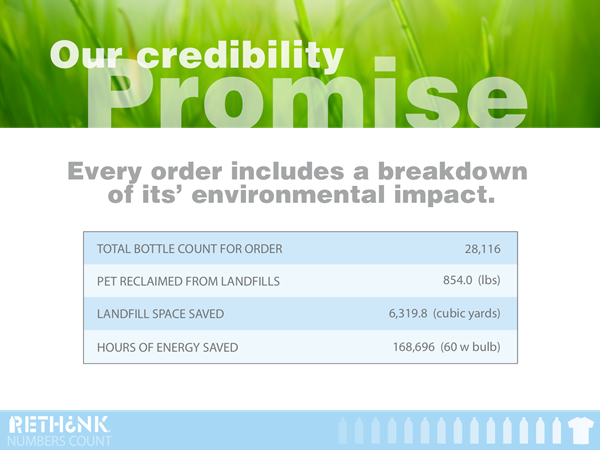 RETHINK FABRICS' MISSION IS TO DIVERT PLASTIC FROM THE OCEAN. WE CREATE INNOVATIVE, QUALITY T-SHIRTS MADE FROM RECYCLED PLASTIC WASTE AND BROUGHT TO LIFE WITH A SIMPLE STORY. WE ARE MAKING A DIFFERENCE FOR THE FUTURE, BRINGING RECYCLED TECHNOLOGY INTO THE MAINSTREAM AND RETHINKING PLASTIC WASTE IN AN UNPRECEDENTED WAY. OUR 100% RECYCLED POLYESTER, ALSO KNOWN AS RPET, DELIVERS SUPERIOR SOFTNESS THAT LOOKS AND FEELS LIKE NOTHING ELSE YOU HAVE WORN BEFORE IN THE SUSTAINABLE MARKET. 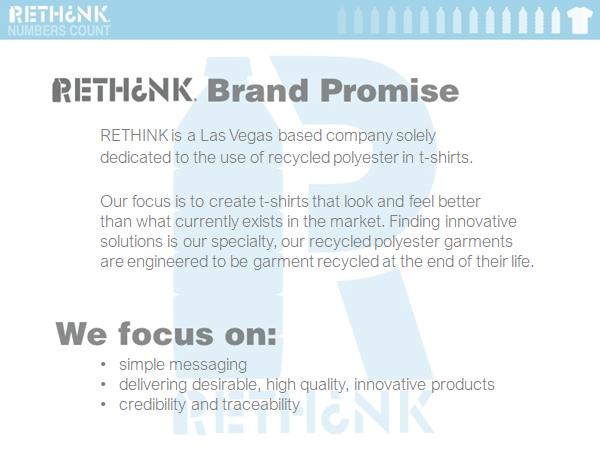 ​​Rethink exclusively specializes in rPET garments, boasting product performance and product detailing, such as competitive anti microbial and wicking features. 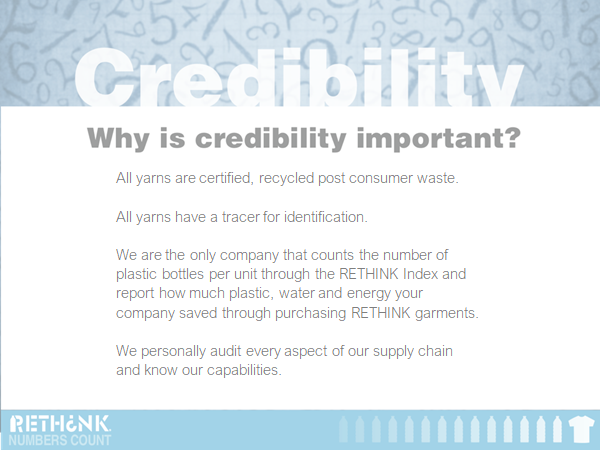 Rethink creates high quality basic apparel that is innovative and certifiable through a tracer in the US fiber and the environmental benefits of the garments are measurable through our Rethink Index. Garment recyclable garments to end waste and complete cradle to cradle cycle. 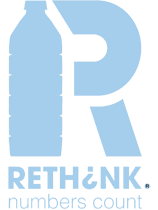 RETHINK's core garments have been engineered for garment recycling; at the end of its life a RETHINK garment can be reclaimed and transformed into a new garment. The old shirt is shredded and turned into PET crystal, the fabric or garment recycled crystal is then extruded and turned into new apparel grade fibers.